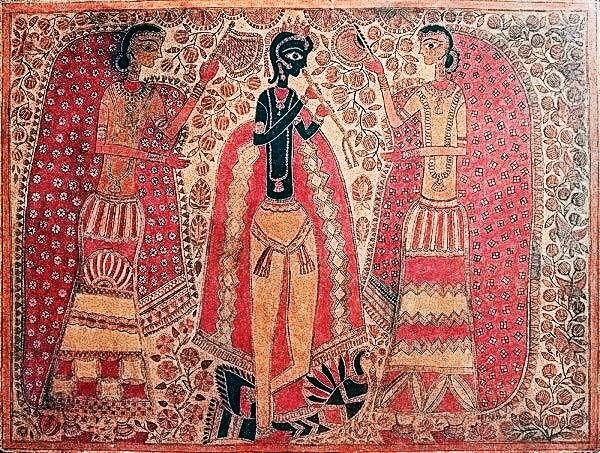 Traditionally painted by women, every element in Mithila designs has a deep-rooted symbolism. The central tenet of the Maithilis’ religion is its unique concept of man’s unity with nature. The Maithilis believe in a oneness of life manifested in all things. Their paintings can be broadly divided into two categories, floor drawings or aripana and wall paintings or bhitta chittra. Click here to read an introductory article by Pradyumna P. Karan. Similar practices with different names exist across India: Kolam in Tamil Nadu; Mandana in Rajasthan; Chowkpurna in Northern India; Alpana in West Bengal; Aripana in Bihar; Chowk pujan in Uttar Pradesh; Muggu in Andhra Pradesh and others. Some other samples following this link, or follow this link for a selections of samples. 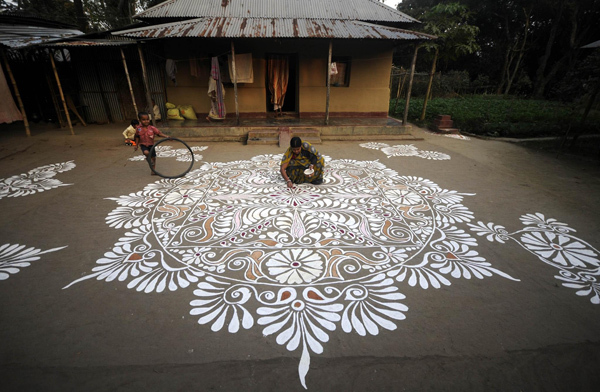 Here is a page dedicated to Rangoli, and here is one on Madhubani.